Secure Your Future. Achieve Your Goals. Looking for a degree that supports your technology-focused goals? Regent's Bachelor of Science in Information Systems Technology (IST)—Information Security will equip you with the skills needed to succeed in the computing technology field. Taught from a Christian perspective, this degree includes coursework in systems security and disaster recovery to prepare you to excel as an IST technology leader. Learn the basics of internet/intranet security and how to defend network systems. Computer systems, networks, databases, intellectual property, computer security, artificial intelligence, legal and ethical considerations, codes of conduct, privacy, computer crimes, and the future of computing and the Internet and their relationship to the business world. Introduces programming fundamentals using Visual Basic.net. Use of algorithms and computer logic to translate data into information through structured design, coding, testing, and program debugging, writing programs in high-level, object-oriented language. Students gain a thorough knowledge of the foundation of eCommerce by studying its role in today’s Internet and the World Wide Web. Course examines web server hardware and software tools utilized in the development of an eCommerce web site as well as criteria for assessing the usability of eCommerce sites. Prerequisite: ISYS 204. Introduction to JAVA programming; a general-purpose object-oriented programming language. Building on the fundamentals of structured and object-oriented programming, students investigate features of JAVA, programming concepts, data types, operators, flow control statements, object classes, methods, arrays, strings, and applets. Prerequisite: ISYS 214. Study of the design of structures for representing information and the design of algorithms for manipulating that information. Expertise in the design of structures through consideration of abstract structures and implementation techniques and implementation of various structures in specific programming languages. Programming projects throughout the course provide a synthesis experience to design data structures and algorithms to solve a given problem. Prerequisite: ISYS 314. Introduction to relational database management systems through the study of the tools and techniques of database analysis and design. Attention to data modeling, designing relational databases, normalization, and relationships, using modern database applications to create tables, queries, forms and reports. Prerequisite: ISYS 214. Principles and applications of computer hardware and software, understood through the theoretical underpinnings, with attention to installation, configurations, and operational laboratory experiences. Course also addresses recent advances in computer hardware and architecture and how they affect computer performance. Prerequisite: ISYS 204. Students gain in-depth knowledge of networking and telecommunications fundamentals including LANs, MANs, WANs, intranets, the Internet, and the WWW. Attention to data communication and telecommunication concepts, models, standards, and protocols in the context of installation, configuration, systems integration, and management of infrastructure technologies. Prerequisite: ISYS 204 and Sophomore standing. 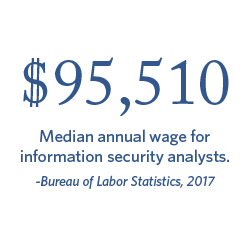 Business and government are facing a rapidly expanding need for information assurance professionals. Information protection program design, internetworking and application security, the development of information security safeguards and information security auditing, disaster recovery, policy development, identity management, and effective threat assessment. Prerequisite: ISYS 204 and Sophomore standing. Securing the systems that run our computers is the key to ensuring that our essential information remains safe and available. This course provides the essentials for understanding the threats to systems security, the methods to counter these threats, and some practical work in systems security. A computer system with appropriate software is required. Prerequisite: ISYS 331. Access to the Internet for multiple purposes is one of the major components of most business operations. Many businesses also have intranets, which provide internal communications. Security of these assets is critical for a successful business. Course provides an introduction to the concepts and procedures of assessing and providing security for internet/intranets. Prerequisite: ISYS 331. Investigation of the techniques of system analysis and design, with attention to the concepts, skills, methodologies, and tools essential for systems analysts to develop information systems successfully. Prerequisite or co-requisite: ISYS 317. Information security must be a significant part of any business plan today, and managers in this field must remain aware of the principles and methodology of managing information security. Provides an in-depth view of the management of information security for government, corporations, and other institutions. Prerequisite: ISYS 331. Global and local networks provide capabilities that have become essential in the success of the world economy for businesses and individuals. Defending these systems against attacks through the use of worms, viruses, and other criminal acts is imperative. Provides a solid foundation in the fundamentals of network security and some hands-on experience in the installation and utilization of firewalls and intrusion detection systems. Prerequisite: ISYS 331. The threats to information security are numerous, and even the best security systems can be penetrated in one manner or another. In addition, physical security is a consideration for securing the systems necessary for business operations to continue. Natural disasters, terrorist activities, and internal subversion can all cause destruction or denial of service. Provides a framework for understanding the threats and how to counter them. Prerequisite: ISYS 331. Capstone course in which advanced IST students, operating as a high-performance team, engage in and complete the design and implementation of a significant information system. Project management, management of the IS function, and systems integration are components of the project experience. Prerequisite or co-requisite: Senior status and ISYS 406.